Struggling with too many commitments? You might want to try a powerful and simple time management technique: saying “no”. 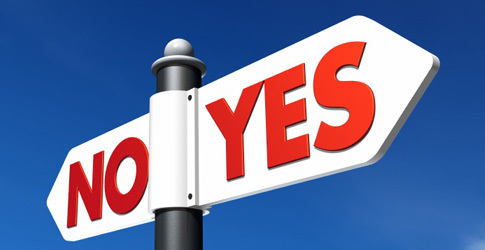 Have you successfully integrated “no” into your repertoire? What motivated you to do so? What challenges have you encountered in saying “no”? If you still say “yes” too often, what’s stopping you from trying a new tactic? I think that learning to say ‘no’ is only part of the solution – we also have to learn to accept ‘no’ as an answer when it is someone else that is saying ‘no’ to us. On the rare occasions where I do finally say ‘no’ to avoid severely over-committing, I find that people are rarely understanding, and will often insist. I was told by several different former grad student’s that had worked with my adviser that I would graduate when I learned to tell him no. It was absolutely true. Not only is it an important skill to learn to avoid being overwhelmed, but I’ve noticed that people generally respect someone who occasionally says no to them more than someone they know will always say yes. Of course most of the time it really is best to say yes as a grad student or post-doc, so we really have to learn how and when.